Designed with the ultimate protection and safety in mind, our Non-Magnetic MRI tool kit is built for Biomedical Service Technicians working on or near highly magnetic MRI equipment. With this kit you'll be ready to safely tackle any job requiring work on or near MRI systems. Our Non-Sparking, Non-Magnetic 3T (3-Tesla Safe), Corrosive Resistant tool kit comes neatly packaged in a hard sided plastic tool case with a custom foam tool controlled interior. This 41-piece tool kit features a variety of combination wrenches, two adjustable wrenches and two hex key sets,(inch and metric). The kit also contains a full set of screwdrivers and a selection of the most commonly used pliers and cutters. Safe for use on GE, Siemens and Philips MRI equipment. This kit is also perfect for Non-Sparking Field Service applications in: Military, Aerospace, Mining, Industrial, Fire Departments, and Utilities. Non-Magnetic - These tools are tested and meet the requirements set forth by the United States Government for Non-Magnetic Hand Tools as defined by MIL-I-17214, are 3-Tesla (3T) safe, and conform to ASTM F2503-05. This enables this tool kit to be used near sensitive magnetic equipment and in clean room environments. Non-Sparking - Approved as Non-Sparking by the Factory Mutual Research Corporation. Ideal for working around hazardous, flammable or combustible vapors, liquids, dusts or residues. Hand Tool Limited Lifetime Warranty - If tool breaks or fails to perform under normal use or service, it will be repaired or replaced at no charge. 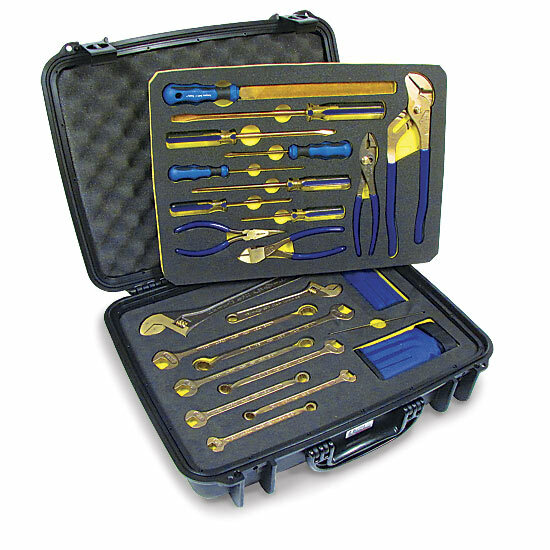 Tool Case Unconditional Lifetime Guarantee - Watertight, Dust Proof, and Auto Purge System. Custom Tool Control Foam Interior - Protects your investment by reducing the potential of tools being left in the work area or damaged due to improper storage. Tools can also be easily located to complete a job faster.